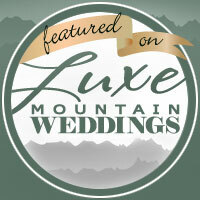 Such an honor to be feature on the Luxe Mountain Weddings Blog as well as in the gorgeous magazine. If you are planning a wedding this upcoming year, this is a wonderful resource!!! Thank you Debbie for such beautiful work! And thank you to Carol and Brian for planning such a remarkable wedding!! !